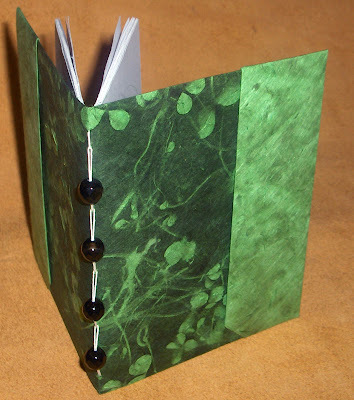 The first swap book to be revealed up close, is this super green booklet from KupoKiley. 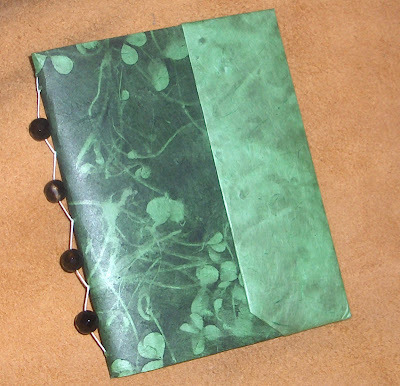 Kiley's book has 24lb white linen paper for the pages and the cover is made from a single sheet of vibrant green clover paper. The cover is made using a unique folding process creating an interesting and functional cover with little pockets. It is entirely vegan, having used no glue or wax in the construction. The binding is a type of running chain stitch, accented with beads. Visit Kiley's Etsy shop to see more of her work. I'm so excited so see my green book on here! I love that book and I had a very large debate with myself about letting it go- but I know it will be worth what I get back! Thank you Beverly! The green on that book is vibrant- I love it. The paper also came in a darker yellow but I didn't like it nearly as much. I envy you being so close to Rhonda! It will be several weeks of suspense for me! The excitement of seeing the other books posted will tide me over until I get my wonderful new book! such beautiful green Kiley! just lovely! It's a lovely book and the color is lush. I really like the beading in the binding.